There is always much to do amongst musicians and/or fans of em about analog or digital? Will we use the warmth of analog or the more reliability but less character of digital? This album has become a sort of contest where each artist could use only three genuine analog synthesizers to create a piece of music (although modern recording techniques were permitted). Create, Remotion, Loren Nerell, Steve Roach and Chuck Oken, Paul Ellis and Steve Roach, 4m33s, Gert Emmens, Syn, Russell Storey, Kees Aerts, Altres, modulator esp and Ian Tescee. The music ranges from traditional sequencer-based berlin school (create, syn, altres, modulator esp), via melodical (remotion, emmens, aerts, tescee), ambient (ellis and roach, 4m33s) to experimental (nerell, roach and oken, storey). All music was played and recorded with care and love for the music and the instruments that it’s played on. "Analogy, volume1" is a great and eagerly awaited project. Hopefully, volume 2 will follow soon. Press Information All tracks on this CD are cross-faded to make "Analogy" a continuous journey. Create opens the sampler with "Analogue Revival" - a fitting title. A heavy bass growl and then the first punchy sequences appear. A super tasty way to open an album to say the least. The sounds are grungy, dirty and industrial-like, brimming with raw analogue power. Another high-pitched sequence can be heard. With only three analogue synthesizers and a drum machine (Jupiter 4, MS-20, Moog Prodigy and TR-707) Steve creates music that's so intense, it's uncanny. It's sequency to the tilt so if you're into those lovely rhythmic pulsations - look no further. The guys from Remotion continue the analogue journey with "Freeflight". This track was made with a Korg MS-10, Roland JX3P, Roland Juno 6 and a TR-606 drum machine. Noise fx and various analogue sounds get things underway. After a while a soft laid-back sequence appears along with an electronic rhythm. This track for some reason reminds me on early Software - a very pleasant connection, as I do enjoy Mergener / Weisser's early efforts a lot. A mournful lead line floats on top resulting in a very emotional journey. Loren Nerell with friends Steve Roach and Chuck Oken (Djam Karet) continue with "Zone Patrol". Using their modular synthesizers, the guys came up with some excellent sounds. It's a deep ambient journey with EMS-like twitters and some deep drones, plus various creaking sounds as if you are hearing some insects on another planet. Wonderful, wonderful stuff! A duo of Paul Ellis and Steve Roach is next with "Where Are You?" - An echoing sequence, some rhythm and subtle string sounds begin this track. This is urgent, upbeat number that still manages to sound spacey and atmospheric. Curious stuff. Nice mysterious melodies as well in the midst of improvisation. A very fat and intense sound here, with some 5 or so sequences heard simultaneously by the end of the track. "Elegy" by 4m33s aka John Sherwood was done exclusively with an Oberheim Matrix-1000 synthesizer. It's melodic, emotional and atmospheric and is a nice change of pace and mood after the somewhat neurotic (but cheerful) track by Ellis & Roach. Some lovely electric piano-like notes are heard towards the end. We then hear twitters that herald the coming of Gert Emmens' excellent "The Morning After". Lovely warm pads and a beepy sequence are what this track is all about, until sweet melodies appear that sound so bright and pleasant it's amazing! With just a Formant modular synth, a Minimoog and a Moog Opus 3 Gert creates a stunning tapestry of sound that is, as is always the case with Gert's music, extremely emotional and full of feeling. Excellent if a bit brief solo appears towards the end. We finish with a reprise of the melodic theme and lots of twittering synth sounds. Syn contributes "Viking Mission II" - a phased Eminent string sound straight out of Jarre's "Oxygene" and symphonic brassy leads plus a melodic sequence make this an extremely intense track. Pure analogue bliss! Syn achieves this with a Doepher A-100 modul. It's amazing how much great music there is on "Analogy", with so many styles represented and yet everything gluing so well together as a cohesive whole. Unbiased mode on: there's not a weak track here, just great analogue music from talented musicians all over the world. Biased mode on: it's so darn fine! You should get it as soon as possible! Period. Syn contributes "Viking Mission II" - a phased Eminent string sound straight out of Jarre's "Oxygene" and symphonic brassy leads plus a melodic sequence make this an extremely intense track. Pure analogue bliss! Syn achieves this with a Doepher A-100 modular synthesizer, an Eminent 310P with Small Stone phaser and a Korg 700S. Amazing Berlin School track, indeed! Bravo, your track is like a crowning jewel of "Analogy". Unknown "Analogy" ist eine TOP-CD!!!! Für mich ist es mit Embrase das Beste von Groove in 2005!!! :-)))))) Weiter so!!!!! 2005. Marcus / LFF. These 12 previously unreleased tracks begin with Steve Humphries, a.k.a. Create, from whom we have the aptly named "Analogue Reviva.". A steady driving sequence keeps this one going. A loud warbly synth sound rings out frequently, perhaps a little too frequently, but mostly it is good fun. Remotion is next with "Freeflight". It starts with formless atmospheres, and eventually a gentle sequence and relaxed melody emerge, very nice. Next come two tracks featuring Steve Roach. He is joined by Loren Nerell and Chuck Oken on "Zone Patrol", a bubbly brew much like Steve’s Possible Planet CD. On "Where Are You?" Steve is teamed up with Paul Ellis in a much livelier affair, with percolating rhythmic loops much like his Life Sequence CD. "Elegy" by 4m33s follows, a smooth delicate piece. "The Morning After" is signature Gert Emmens firmly rooted in the retro style. "Viking Mission II" by Syn effectively combines an array of influences from Jean-Michel Jarre, Vangelis and others into an appealing Berlin school selection. Three of the last five cuts are by names unfamiliar to me, beginning with New Zealander Russell Storey’s "Cosmic Kiw.". This is cosmic indeed, with twitters, wind and bubbling noises. As a transition piece it is pretty cool, but I’m not sure what a full CD of this would sound like. The co-lead of Groove’s label, Kees Aerts, is next with "Grey Key.". He begins by laying down a very soothing atmosphere with synth strings and sparse bass notes, before letting go with a very nice sequence. Reminiscent of early Jarre, it stays very laid back, enjoyable throughout. Next is unknown Altres, with "Brain Flame", an all-out growling sequencer blitz that thoroughly satisfies – I definitely want to hear more from this quartet! "Tsunami" is an active piece by Modulator ESP, lots of fun knob twiddling going on here. Lastly is "Aquamarine" by Ian Tescee, a sweet but sad piece that makes a fitting ending on a slightly different note from the rest. This is an excellent compilation, highly recommended. 2005. Phil Derby / Electroambient Space All the synthesizers used in this CD are analog. Although the diversity of styles is remarkable, most of the themes can be labelled within Space Music. In this album, you can hear a marvellous collection of pieces. These are the contents of the anthology: Create: "Analogue Revival". Remotion: "Freeflight". Loren Nerell & Steve Roach & Chuck Oken: "Zone Patrol". Paul Ellis & Steve Roach: "Where are you?". 4m33s: "Elegy". Gert Emmens: "The Morning after". Syn: "Viking Mission II". Russell Storey: "Cosmic Kiwi". Kees Aerts: "Grey Keys". Altres: "Brain Flame". Modulator ESP: "Tsunami". Ian Tescee: "Aquamarine". 2006. Edgar Kogler The "Analogy Vol. 1" compilation was spawned under the ruling that each artist could use no more than 3 synths (not counting drum machines, effects units, etc.). The major selling point is probably the inclusion of "Zone Patrol", a collaboration between Steve Roach, Loren Nerell and Djam Karet's Chuck Oken in typically abstract style while Roach again turns up alongside Paul Ellis on the nicely ethnic "Where Are You?". One major surprise is the return of Altres with Kevin Guthrie again at the helm and while their "Brain Flame" boasts some very TD-like sequences there's surprisingly few straight Berlin School tracks here. Create come close but even here the strong rhythms provide some backbone while the more melodic offerings from Kees Aerts (with a strong Jarre influence), Gert Emmens and Ian Tescee all provide highlights, in contrast to Remotion's instantly forgettable track and Russell Storey's abstract "Kiwi". Modulator ESP do themselves no harm with "Tsunami" which ably evokes images of the terrible event. Carl Jenkinson Po átkem byla disputace klad a zápor analogových versus pln digitálních hudebních nástroj. V tší puristé analogových milá k pak p isp chali s myšlenkou kompilace, která by p edstavila tyto hudební nástroje, asto ob ímích rozm r, v plném nasazení na za átku 21. století. Zadání bylo prosté: ke tvorb skladby bylo mo no pou ít maximáln t í analogových nástroj , nepo ítám-li se sequencery, automatickými bubeníky nebo nástroji, jako je elektrická kytara apod. Všechno sna ení samoz ejm bylo snímáno, na rozdíl od tvorby pionýr elektronické muziky, moderní nahrávací technikou. Výsledkem této neobvyklé sout e je více jak 100 minut hudby, z nich se nakonec na disk dostalo dvanáct track s maximálním vyu itím stopá e lisovaného CD. Mezi p isp vateli najdeme kmenové um lce Groove Unlimited vydavatelství - Create, Gert Emmense, projekt Syn nebo samotného šéfa labelu Keese Aertse. Z t ch trochu p espolních jmenujme ambientá e Steve Roache, Lorena Nerella nebo tve ici Altres s dv ma elektrickými kytarami ve svém st edu. A výsledek? Nad o ekávaní ivotný i v dnešních dnech. Ano, setkáme se zde s revivalem, který mo ná a moc kopíruje své vzory Tangerine Dream, Klaus Schulzeho, raného J. M. Jarreho nebo Ashra, ale na druhou stranu obsahuje i ryze moderní kousky, zalo ené na ultra oldschool aran ích. P íkladem budi otvírák Analog Revival od anglické dvojice Create, který má ukrutný tah na bránu, ambientní modern -analogové kouzlení p edvedou pánové Loren Nerell, Steve Roach a Chuck Oken v Zone Patrol nebo melodicky vyklenutá Elegy od projektu 4m33s. Kompilace jako stvo ená pro všechny ty, kte í kdy p íjemn zabloudili v rozsáhlých bludištích elektronické psychedelie 70. let. Album je navíc v nováno nedávno zem elému Robertu Moogovi, jeho dlouhá ada nástroj zde hraje "první housle". Create: buzzing textures converge with lively results. Remotion: an excursion into bubbling territories. Loren Nerell, Steve Roach, and Chuck Oken (from Djam Karet): a clash of density, astral voids, and atmospheric structure. Paul Ellis and Steve Roach: lively tones cavort with energetic e-perc. 4m33s: a pensive dose of melancholic moodiness. Gert Emmens: a drive in the country ends up plunging into outer space. Syn: nostalgic gear produces a particularly modern astral piece with notable pep. Russell Storey: gurgling diodes are pushed to their bubbly limits. Kees Aerts: contemporary EM meets techno with cosmic flavor. Altres: deep tones race with urgent intentions. Modulator ESP: frantic keys blend with a tidal wave of pulsations. Ian Tescee: a more pastoral tone is presented for the cds finale. Blended into a continuous flow, these tunes create a satisfying voyage through divergent realms. While analog equipment may be considered archaic by many, these musicians illustrate that creativity is never limited by its tools. Matt Howarth / Sonic Curiosity Analog or digital? That is the question. This compilation-album is a product by members of the Internet discussion board, dedicated to electronic music. There is always much to do amongst musicians and/or fans of EM (and also of other music) about what to use: analog or digital? The warmth of analog or the more reliability but less character of digital? This album has become a sort of contest where each artist could use only three genuine analog synthesizers to create a piece of music (although modern recording techniques were permitted). 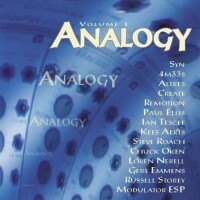 "Analogy, Volume 1" contains music by some of the finest EM-musicians of the present days: Create, Remotion, Loren Nerell, Steve Roach and Chuck Oken, Paul Ellis and Steve Roach, 4m33s, Gert Emmens, Syn, Russell Storey, Kees Aerts, Altres, Modulator ESP and Ian Tescee. The music ranges from traditional sequencer-based Berlin School (Create, Syn, Altres, Modulator ESP), via melodically (Remotion, Emmens, Aerts, Tescee), ambient (Ellis and Roach, 4m33s) to experimental (Nerell, Roach and Oken, Storey). I don’t find all music even strong but Create, Emmens, Remotion, Aerts and Ellis and Roach deliver excellent pieces. All music was played and recorded with care and love for the music and the instruments it is played on. In my opinion, mores volumes may follow. Paul Rijkens / SonicImmersion.org Voici un projet intéressant qui ravira les nostalgiques de la musique électronique typique des seventies. Réalisé entièrement par les musiciens d’un forum dédié à la E-music, ceux-ci se sont donnés comme contrainte de n’utiliser que trois synthesizers analogiques (pas de séquenceurs numériques, boîte à rythmes ou d’autres instruments tels que la guitare par exemple) pour composer leur musique. Ceux vénérant le Minimoog, les vieux Korg, Roland et autres Matrix vont donc être servis. Ambiances hypnotiques, belles mélodies, passages relaxants et autres mélopées synthétiques dans l’esprit d’un Schulze, Tangerine Dream ou Vangelis composent le programme musical de cette compile. A l’exception de deux plages barbantes dans lesquelles rien ne se passe si ce n’est un enchaînement de bidouilleries sonores sans queue ni tête, ce disque est intéressant pour découvrir ou redécouvrir un genre qui compte toujours son lot de vrais passionnés.